This was accomplished using microwave signals, allowing the properties of the comb—including the bandwidth, the spacing between the teeth, the height of lines and which frequencies are on and off—to be tuned independently. "These compact frequency combs are especially promising as light sources for optical communication in data centers," said Joseph Kahn, Professor of Electrical Engineering at Stanford and the other senior author of the study. "In a data center—literally a warehouse-sized building containing thousands of computers—optical links form a network interconnecting all the computers so they can work together on massive computing tasks. 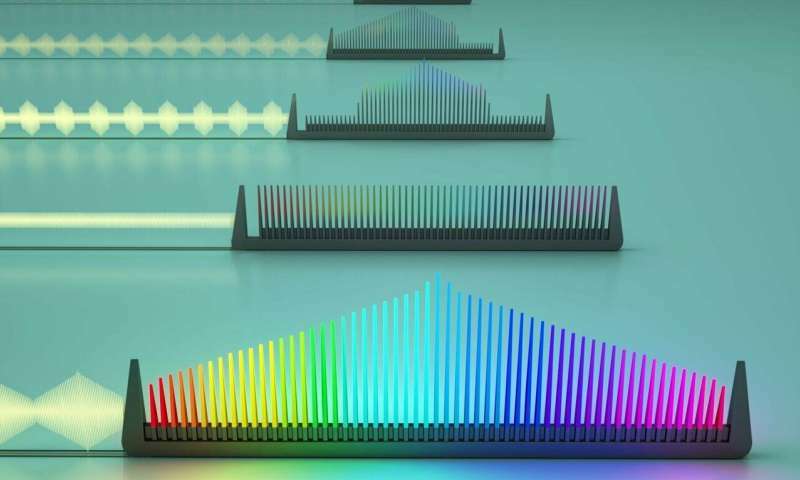 A frequency comb, by providing many different colors of light, can enable many computers to be interconnected and exchange massive amounts of data, satisfying the future needs of data centers and cloud computing. Could this, in theory, be used to make a simple drug detection device? Laser detecting the spectrographic signatures of things like Fentanyl could be built into a car based system. If that actually happens, we no longer have to take the word of the officer that they detected the odor coming from a vehicle, they would have the record of the device to back them up.